Plexpy is a python based web application for monitoring, analytics, and notifications for Plex Media Server. This project is based on code from Headphones and PlexWatchWeb. In this article, we will talk about Plexpy and it benefits. To be able to install and run Plexpy, you need to have Plex Media Server, because these two are linked and you access your Plexpy with your user credentials of Plex account. Plexpy is easily accessible via desktop, tablets and mobile devices, so by doing that you can always monitor your data and server. Plexpy is developed to look like Plex, so if you are accessing it for the first time, you will already be familiar with it. Activity: Those are streams that are active at the moment. Watch Statistic: Will show you: most watched movie, most popular movie, most active user, and most active platform on your Plex account. Library statistics: Data about your libraries. Recently added: Will show you all recently added content to you Plex. In Library tab you will find all information about your Plex libraries. First, you will see the list of all libraries and number of files they contain, so you can easily go thru and navigate to your preferred one. After you picked your preferred library from the list you can see all the information about it. Users tab will show you all active users on your server, which is perfect if you are sharing your Plex account with your family and friends. In this tab you can see detailed information about users like IP, activity, what they are playing at the moment etc. You are presented with the list of users so as in libraries tab you can pick and chose your preferred one if you want more information about it. After you picked your preferred user from the list you can see all the information about it. In History tab you can see all activity that happened on your server, like which user streamed when he streamed it, and what he streamed. In the right top corner, you will see advanced search options that will allow you to browse your history quickly and efficiently. Graph tab will show you all the information that you can see in Home tab but represented by graphs and shown in time periods. So you can have a much better look at your statistics. In Settings tab you can find all common settings and parameters. The one thing that you are able to set up are the notifications. 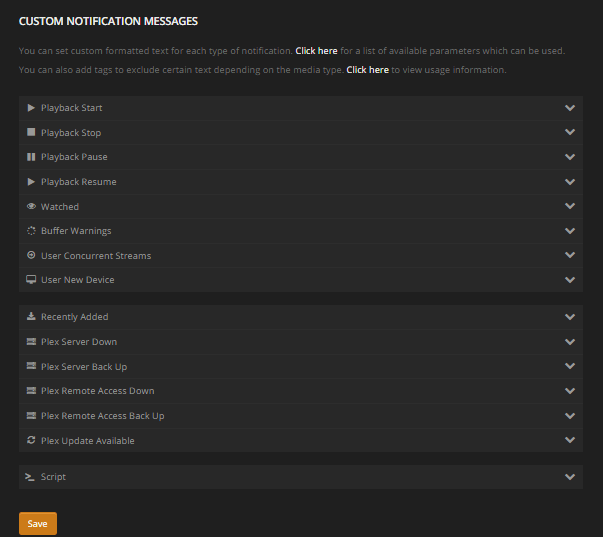 You can set up custom notifications that you will get from Plexpy when something is changed on your Plex server, so you can be 100% up to date what is happening on your server. 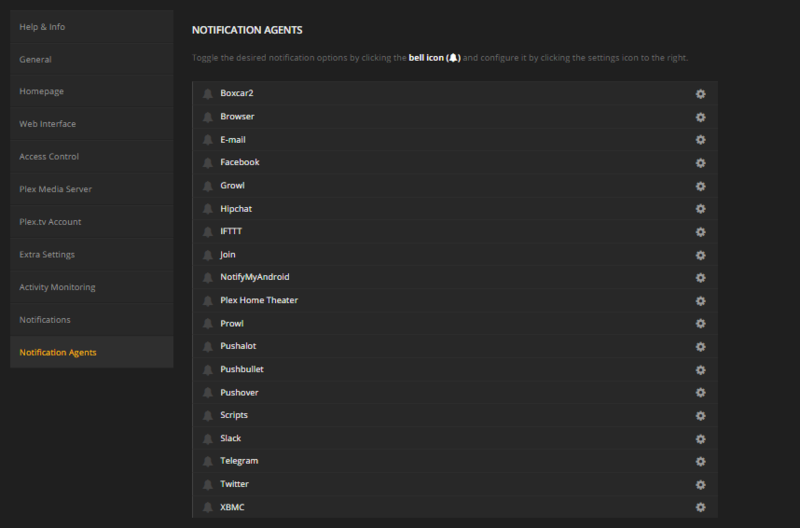 You can also choose which agent you want to be notified about happenings on your server.